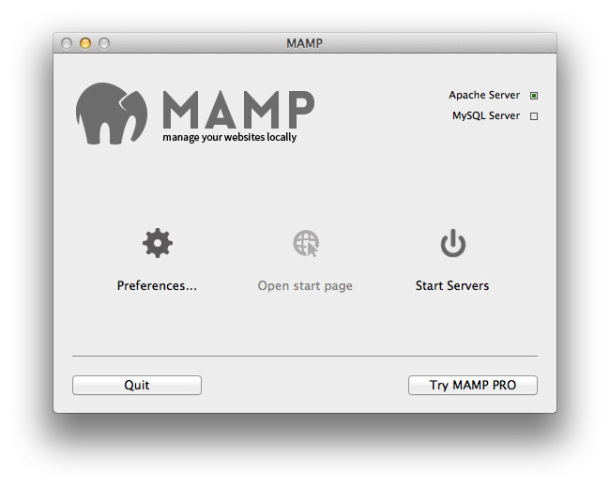 MAMP: It stands for Mac Apache MySql PHP, and it’s a fantastic setup for Mac based web developers. Basically, think LAMP but for OS X users, and in a pre-packaged, simple to use environment, which also indludes PHPMyAdmin, perl, python, and SQL Lite. MAMP delivers on all of these fronts and it does it very efficiently. MAMP is nice because you can install it (and delete it) without altering anything “built-in” to your OS X installation, no manually tweaking apache, mysql, php, etc, it’s all there in a bundle. Every file that MAMP needs and uses lives inside of the MAMP folder that you download, and yes this includes all php, mysql and apache configuration files. MAMP ships with a small application that when launched gives you the ability to switch port numbers and control the state of the servers. Also included is a dashboard widget which allows for the same control, from a slightly different angle. For those command-line faint of heart, MAMP ships with phpMyAdmin a very nice front end to MySQL. All of this, out of the box, for free! Other eye-catching features include the ability to switch from PHP 4 to PHP 5 and the ability to enable cache mechanisms on the fly. Visit the official MAMP site here for more details and to download the free package. If you need to setup a local web development environment on a Mac, it’s hard to beat MAMP, and if you’re really serious about development, there’s even a MAMP Pro version that includes additional features and options. It’s hard to imagine an easier solution for OS X, which makes MAMP a real winner, whether you’re a longtime dev or a novice just getting started with a local environment. I also been using xampp but in OSX there’s bundled apache and php, why use mamp? I’m not flaming, I’m really want to know why you can prefer mamp. By the way enabling this is really simple (see this: http://www.procata.com/blog/archives/2007/10/28/working-with-php-5-in-mac-os-x-105/).